Kingston, ON – Oct. 28, 2015 – Three international business school rankings were released earlier this month, with Smith School of Business ranked among the top schools in the world. The Financial Times released its annual ranking of Executive MBA programs, and both of Queen’s EMBA programs excelled in it. The National EMBA was ranked #67 of the top 100 executive MBA programs in the world — an increase of 32 places from the 2014 ranking. Two key criteria contributed to this incredible rise: an increase in average alumni salary three years after graduation (worth 20% of the ranking) and an increase in the level of seniority for alumni post-EMBA (worth 5%). Queen’s EMBA Americas held steady at #53, and also saw an increase in salary three years after graduation over 2014. Two full-time MBA rankings were also released in October. Businessweek ranked five Canadian schools as part of its international ranking, which excludes U.S. schools. Queen’s MBA was ranked #2 in Canada, and #9 in the world. Businessweek’s 2015 Best Business School ranking employs a completely new methodology than previous rankings, including a focus on post-MBA careers and salaries. Queen’s re-entered the Economist ranking of full-time MBA programs for the first time in more than 10 years. Out of 100 schools globally, the Smith School’s program was ranked #80 in the world (#3 in Canada), with five Canadian schools participating. The Economist Top 100 full-time MBA ranking blends a number of criteria, including quality of faculty, students and career services, as well as post-MBA salary. 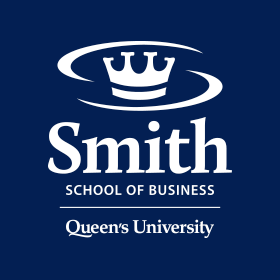 The Stephen J. R. Smith School of Business at Queen’s University (Smith School of Business) is one of the world’s premier business schools—renowned for exceptional programs, outstanding faculty and research, and the quality of its graduates. Thanks to a $50 million transformational gift from Stephen Smith, the Smith School continues to provide students with academic excellence and a superior overall experience. Smith School of Business—where Canada’s first Commerce program was launched in 1919—is located at Queen’s University in Kingston, Ontario. The School delivers programs at locations across Canada, as well in the United States, the Middle East and North Africa (MENA) region and China.